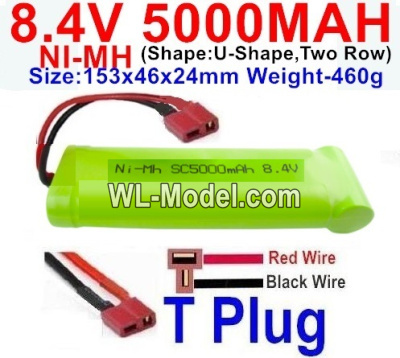 Ni-MH 8.4V 5000MAH Battery,8.4V 5000MAH Battery Akuu-With T Plug-Horizontal-Red wire,Vertical-Black Wire-(Shape-U-Shape,Two Row)-Size-153x46x24mm,8.4V RC Truck Battery,8.4V RC Car battery,RC Boat battery,RC Robot battery,8.4V rc Tank battery,rc toys battery etc. 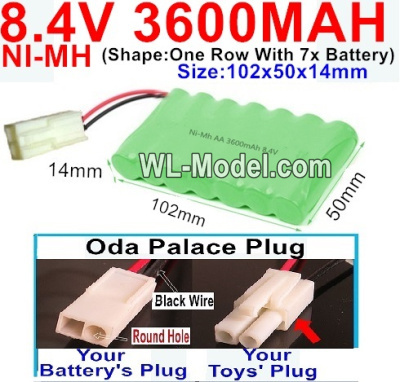 Ni-MH 8.4V 5000MAH Battery,8.4V 5000MAH Battery Akuu-With Oda Palace Plug(Round hole-Black Wire)-(Shape-U-Shape,Two Row)-Size-153x46x24mm,8.4V RC Truck Battery,8.4V RC Car battery,RC Boat battery,RC Robot battery,8.4V rc Tank battery,rc toys battery etc. 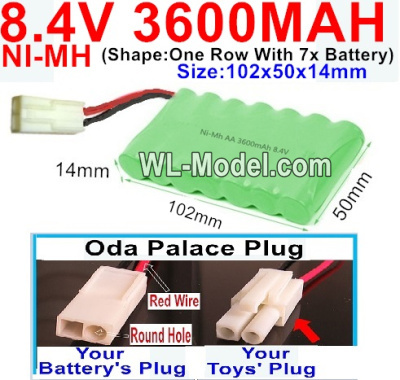 Ni-MH 8.4V 5000MAH Battery,8.4V 5000MAH Battery Akuu-With Oda Palace Plug(Round hole-Red Wire)-(Shape-U-Shape,Two Row)-Size-153x46x24mm,8.4V RC Truck Battery,8.4V RC Car battery,RC Boat battery,RC Robot battery,8.4V rc Tank battery,rc toys battery etc. 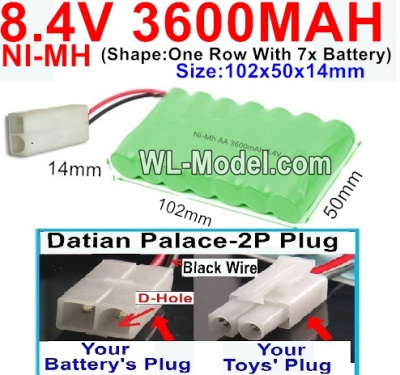 Ni-MH 8.4V 5000MAH Battery,8.4V 5000MAH Battery Akuu-With Datian Palace-2P Plug(The D-Shape hole is Black wire)-(Shape-U-Shape,Two Row)-Size-153x46x24mm,8.4V RC Truck Battery,8.4V RC Car battery,RC Boat battery,RC Robot battery,8.4V rc Tank battery,rc toys battery etc. 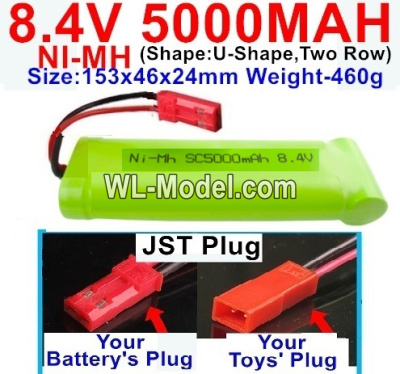 Ni-MH 8.4V 5000MAH Battery,8.4V 5000MAH Battery Akuu-With JST Plug-(Shape-U-Shape,Two Row)-Size-153x46x24mm,8.4V RC Truck Battery,8.4V RC Car battery,RC Boat battery,RC Robot battery,8.4V rc Tank battery,rc toys battery etc. 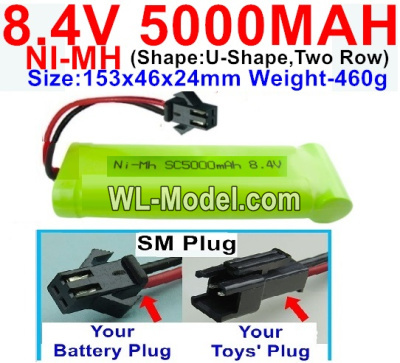 Ni-MH 8.4V 5000MAH Battery,8.4V 5000MAH Battery Akuu-With SM Plug-(Shape-U-Shape,Two Row)-Size-153x46x24mm,8.4V RC Truck Battery,8.4V RC Car battery,RC Boat battery,RC Robot battery,8.4V rc Tank battery,rc toys battery etc. 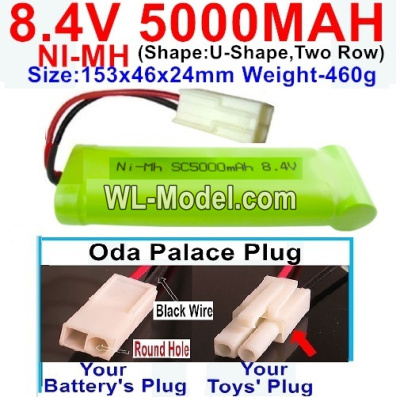 Ni-MH 8.4V 3600MAH Ni-MH Battery AA,8.4V 3600MAH Battery Akuu-With Oda Palace Plug(Round hole-Black Wire)-(Shape-One Row with 7x battery)-Size-102x50x14mm,8.4V RC Truck Battery,8.4V RC Car battery,RC Boat battery,RC Robot battery,8.4V rc Tank battery,rc toys battery etc. 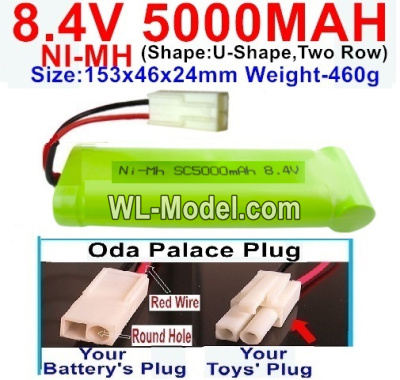 Ni-MH 8.4V 3600MAH Ni-MH Battery AA,8.4V 3600MAH Battery Akuu-With Oda Palace Plug(Round hole-Red Wire)-(Shape-One Row with 7x battery)-Size-102x50x14mm,8.4V RC Truck Battery,8.4V RC Car battery,RC Boat battery,RC Robot battery,8.4V rc Tank battery,rc toys battery etc. 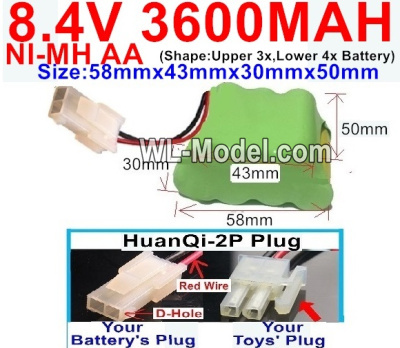 Ni-MH 8.4V 3600MAH Ni-MH Battery AA,8.4V 3600MAH Battery Akuu-With HuanQi-2P plug(1X Square hole+ 1X D-Shape Hole.The D-Shape Hole is Red Wire)-(Shape-One Row with 7x battery)-Size-102x50x14mm,8.4V RC Truck Battery,8.4V RC Car battery,RC Boat battery,RC Robot battery,8.4V rc Tank battery,rc toys battery etc. 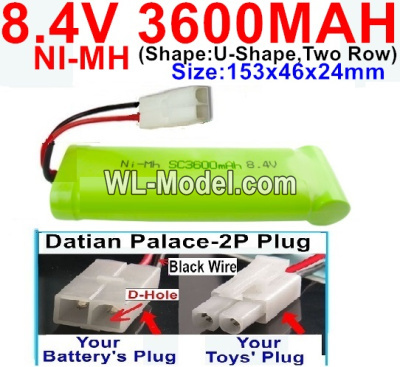 Ni-MH 8.4V 3600MAH Ni-MH Battery AA,8.4V 3600MAH Battery Akuu-With Datian Palace-2P Plug(The D-Shape hole is Black wire)-(Shape-One Row with 7x battery)-Size-102x50x14mm,8.4V RC Truck Battery,8.4V RC Car battery,RC Boat battery,RC Robot battery,8.4V rc Tank battery,rc toys battery etc. 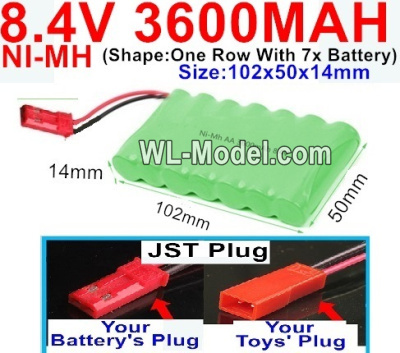 Ni-MH 8.4V 3600MAH Ni-MH Battery AA,8.4V 3600MAH Battery Akuu-With JST Plug-(Shape-One Row with 7x battery)-Size-102x50x14mm,8.4V RC Truck Battery,8.4V RC Car battery,RC Boat battery,RC Robot battery,8.4V rc Tank battery,rc toys battery etc. 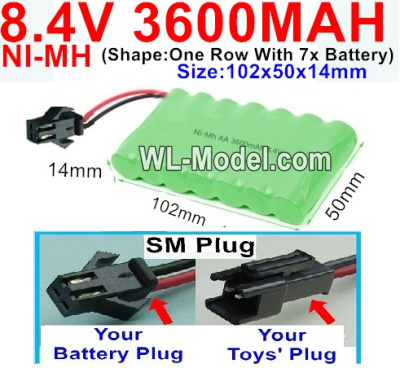 Ni-MH 8.4V 3600MAH Ni-MH Battery AA,8.4V 3600MAH Battery Akuu-With SM Plug-(Shape-One Row with 7x battery)-Size-102x50x14mm,8.4V RC Truck Battery,8.4V RC Car battery,RC Boat battery,RC Robot battery,8.4V rc Tank battery,rc toys battery etc. 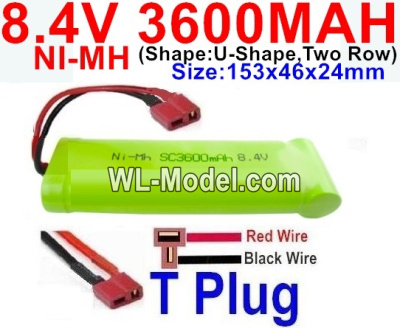 Ni-MH 8.4V 3600MAH Battery,8.4V 3600MAH Battery Akuu-With T Plug-Horizontal-Red wire,Vertical-Black Wire-(Shape-U-Shape,Two Row)-Size-153x46x24mm,8.4V RC Truck Battery,8.4V RC Car battery,RC Boat battery,RC Robot battery,8.4V rc Tank battery,rc toys battery etc. 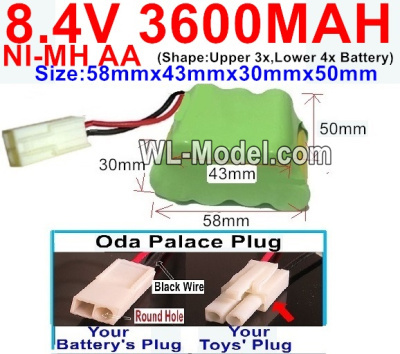 Ni-MH 8.4V 3600MAH Battery,8.4V 3600MAH Battery Akuu-With Oda Palace Plug(Round hole-Black Wire)-(Shape-U-Shape,Two Row)-Size-153x46x24mm,8.4V RC Truck Battery,8.4V RC Car battery,RC Boat battery,RC Robot battery,8.4V rc Tank battery,rc toys battery etc. 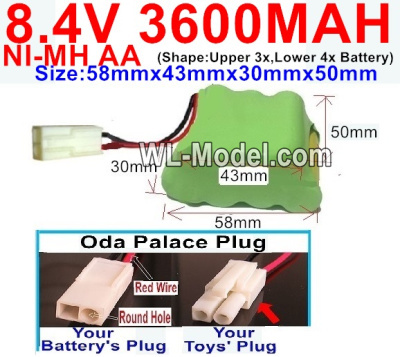 Ni-MH 8.4V 3600MAH Battery,8.4V 3600MAH Battery Akuu-With Oda Palace Plug(Round hole-Red Wire)-(Shape-U-Shape,Two Row)-Size-153x46x24mm,8.4V RC Truck Battery,8.4V RC Car battery,RC Boat battery,RC Robot battery,8.4V rc Tank battery,rc toys battery etc. 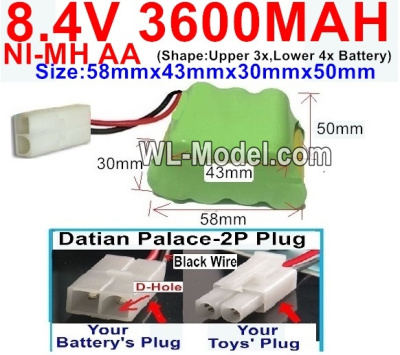 Ni-MH 8.4V 3600MAH Battery,8.4V 3600MAH Battery Akuu-With Datian Palace-2P Plug(The D-Shape hole is Black wire)-(Shape-U-Shape,Two Row)-Size-153x46x24mm,8.4V RC Truck Battery,8.4V RC Car battery,RC Boat battery,RC Robot battery,8.4V rc Tank battery,rc toys battery etc. 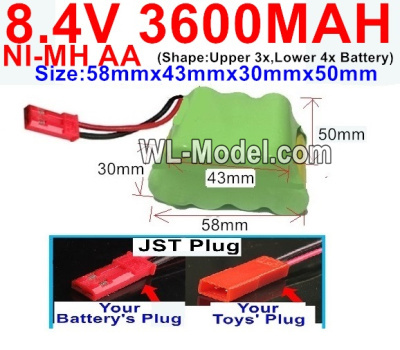 Ni-MH 8.4V 3600MAH Battery,8.4V 3600MAH Battery Akuu-With JST Plug-(Shape-U-Shape,Two Row)-Size-153x46x24mm,8.4V RC Truck Battery,8.4V RC Car battery,RC Boat battery,RC Robot battery,8.4V rc Tank battery,rc toys battery etc. 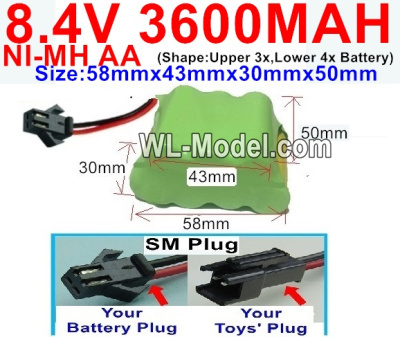 Ni-MH 8.4V 3600MAH Battery,8.4V 3600MAH Battery Akuu-With SM Plug-(Shape-U-Shape,Two Row)-Size-153x46x24mm,8.4V RC Truck Battery,8.4V RC Car battery,RC Boat battery,RC Robot battery,8.4V rc Tank battery,rc toys battery etc. 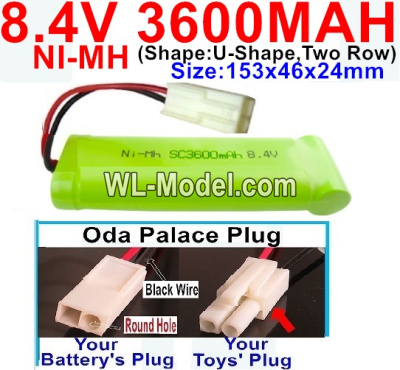 Ni-MH 8.4V 3600MAH Ni-MH Battery AA,8.4V 3600MAH Battery Akuu-With Oda Palace Plug(Round hole-Black Wire)-(Shape-Two Row,Upper Row with 3x Battery,Lower Row with 4x Battery)-Size-58mm(Long length)X43mm(Short length)X30mmX50mm,8.4V RC Truck Battery,8.4V RC Car battery,RC Boat battery,RC Robot battery,8.4V rc Tank battery,rc toys battery etc. 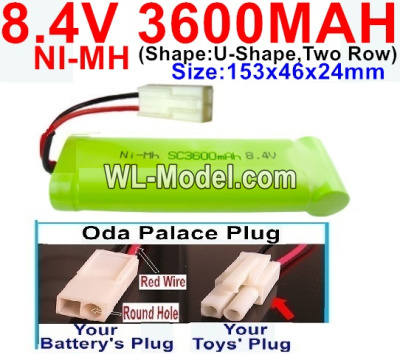 Ni-MH 8.4V 3600MAH Ni-MH Battery AA,8.4V 3600MAH Battery Akuu-With Oda Palace Plug(Round hole-Red Wire)-(Shape-Two Row,Upper Row with 3x Battery,Lower Row with 4x Battery)-Size-58mm(Long length)X43mm(Short length)X30mmX50mm,8.4V RC Truck Battery,8.4V RC Car battery,RC Boat battery,RC Robot battery,8.4V rc Tank battery,rc toys battery etc. 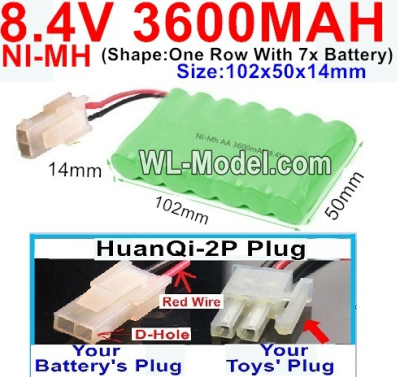 Ni-MH 8.4V 3600MAH Ni-MH Battery AA,8.4V 3600MAH Battery Akuu-With HuanQi-2P plug(1X Square hole+ 1X D-Shape Hole)-(Shape-Two Row,Upper Row with 3x Battery,Lower Row with 4x Battery)-Size-58mm(Long length)X43mm(Short length)X30mmX50mm,8.4V RC Truck Battery,8.4V RC Car battery,RC Boat battery,RC Robot battery,8.4V rc Tank battery,rc toys battery etc. 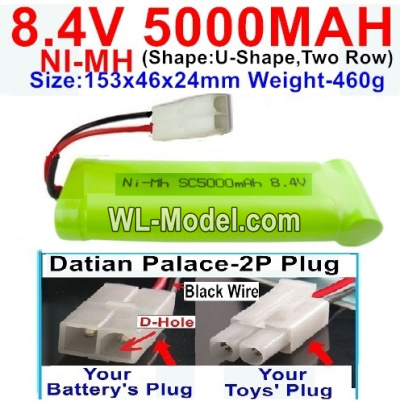 Ni-MH 8.4V 3600MAH Ni-MH Battery AA,8.4V 3600MAH Battery Akuu-With Datian Palace-2P Plug(The D-Shape hole is Black wire)-(Shape-Two Row,Upper Row with 3x Battery,Lower Row with 4x Battery)-Size-58mm(Long length)X43mm(Short length)X30mmX50mm,8.4V RC Truck Battery,8.4V RC Car battery,RC Boat battery,RC Robot battery,8.4V rc Tank battery,rc toys battery etc. 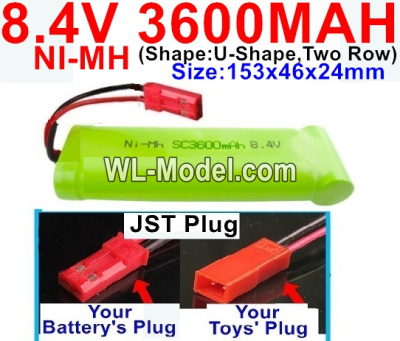 Ni-MH 8.4V 3600MAH Ni-MH Battery AA,8.4V 3600MAH Battery Akuu-With JST Plug-(Shape-Two Row,Upper Row with 3x Battery,Lower Row with 4x Battery)-Size-58mm(Long length)X43mm(Short length)X30mmX50mm,8.4V RC Truck Battery,8.4V RC Car battery,RC Boat battery,RC Robot battery,8.4V rc Tank battery,rc toys battery etc. 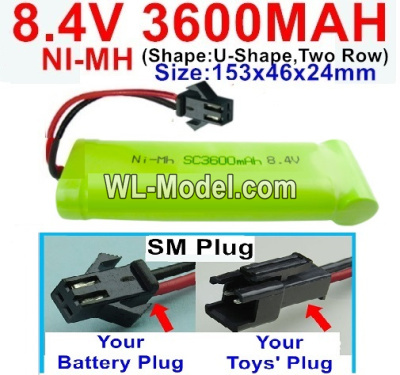 Ni-MH 8.4V 3600MAH Ni-MH Battery AA,8.4V 3600MAH Battery Akuu-With SM Plug-(Shape-Two Row,Upper Row with 3x Battery,Lower Row with 4x Battery)-Size-58mm(Long length)X43mm(Short length)X30mmX50mm,8.4V RC Truck Battery,8.4V RC Car battery,RC Boat battery,RC Robot battery,8.4V rc Tank battery,rc toys battery etc. 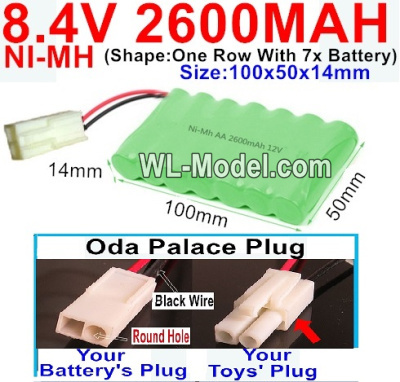 Ni-MH 8.4V 2600MAH Ni-MH Battery AA,8.4V 2600MAH Battery Akuu-With Oda Palace Plug(Round hole-Black Wire)-(Shape-One Row with 7x battery)-Size-100x50x14mm,8.4V RC Truck Battery,8.4V RC Car battery,RC Boat battery,RC Robot battery,8.4V rc Tank battery,rc toys battery etc. Ni-MH 8.4V 2600MAH Ni-MH Battery AA,8.4V 2600MAH Battery Akuu-With Oda Palace Plug(Round hole-Red Wire)-(Shape-One Row with 7x battery)-Size-100x50x14mm,8.4V RC Truck Battery,8.4V RC Car battery,RC Boat battery,RC Robot battery,8.4V rc Tank battery,rc toys battery etc. Ni-MH 8.4V 2600MAH Ni-MH Battery AA,8.4V 2600MAH Battery Akuu-With HuanQi-2P plug(1X Square hole+ 1X D-Shape Hole.The D-Shape Hole is Red Wire)-(Shape-One Row with 7x battery)-Size-100x50x14mm,8.4V RC Truck Battery,8.4V RC Car battery,RC Boat battery,RC Robot battery,8.4V rc Tank battery,rc toys battery etc. Ni-MH 8.4V 2600MAH Ni-MH Battery AA,8.4V 2600MAH Battery Akuu-With Datian Palace-2P Plug(The D-Shape hole is Black wire)-(Shape-One Row with 7x battery)-Size-100x50x14mm,8.4V RC Truck Battery,8.4V RC Car battery,RC Boat battery,RC Robot battery,8.4V rc Tank battery,rc toys battery etc.